FolkWorld's Continental Celts series goes this isssue to Denmark's most famous town in terms of Folk music, to Tønder. This is where the Scottish band Drones & Bellows is based. We have met during the Tønder Festival 99 one of the band members, Pam Naylor, and the producer of their latest CD, Brian McNeill. And Brian summed up exactly what this series is also about: "There is no reason why Scottish and Irish stuff should not cross every cultural devide, and still stay true to the tunes. It's wonderful." Drones & Bellows have presented with their new CD, "Bothwell" (reviewed last issue) an impressive work of high quality Scottish music. Of this six piece band, five musicians are Danish, while Pam is the only one with Scottish roots. The story gets another interesting flavour with the fact that Pam did not know about Scottish music when she was in Scotland. "I got interested in Scottish music only when I left Scotland," tells Pam. "Somebody took me to a Tannahill Weavers concert in Hamburg. My friends thought I was feeling homesick so they took me there, and then I discovered the whole lot of music that I never knew it existed. Shortly after that I discovered the Battlefield Band, so that is all about that. It's more than 20 years ago now." It took 5 years between having discovered the traditional music of her home country and starting to play herself. Up until then she had only played classical stuff. "I started off with a German group 15 years ago, and we just gradually went into Scottish and Irish stuff. And I have been now in Tønder for twelve years, and that's where I have met three musicians to form a new band". Two of those three are today also in Drones & Bellows. "We think that the music is gradually becoming more and more Scottish." What was it like for her to come to Germany and discover there her musical background? "It is not necessarily my musical background. I think if I had stayed in Scotland I might never put an interest in it. I have never discovered it there, because it is very difficult to find the music, to realize that it was there. I was at university, and I was up in the disco while downstairs Silly Wizard were playing - I had no idea who Silly Wizard were!" 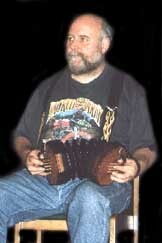 It is the old odd story that sometimes it is more difficult to find out about trad music in the home country than in other places around the world. Although Brian McNeill thinks that it is getting better now with the publicity of Scottish music in Scotland, Pam remembers her last trip to Scotland in summer: "I was up in Dunkeld in summer, and went into Dougie McLean's music bar; it was very quiet. I said 'Where is all the music, where are all the musicians?' - 'Oh, they are all on the continent right now to earn some money.'" 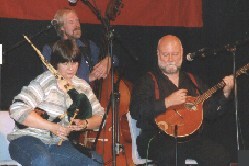 Meanwhile, the interest for Celtic music on the European continent enriches the Celtic music scene in general. Bands on the continent give a bit of a different spirit to the music, and that is just what makes bands like Drones & Bellows interesting - also for audiences in Scotland or Ireland. Asking Brian McNeill, being one of the busiest folk musicians from Scotland and having produced already quite a few albums for some of the best musicians on the scene, if there were any differences to producing the album of Drones & Bellows as a Danish band. "I think the difference for me is that Drones & Bellows had a personal connection to my music, because they did my tune Destitution Road, and they did such a good job of it. I mean - a lot of people play my tunes, and some of the versions are so bad, they are just not listenable. And when I heard this, I became interested in them, I wanted to know what they were like as people." When they met, Brian directly realised that they had a very similar way of thinking, and decided to produce their CD. "It doesn't matter to me whether they are people from Denmark or from Germany or from Scotland or from the States or from Argentinia - you know I got an e-amail about a year ago, there is a puppet theatre in Rio de Janeiro which is using some of my music." - "I think it is wonderful you know. There is no reason why the stuff should not cross every cultural devide, and still stay true to the tunes I think. I don't care where the stuff comes from, all I care about is whether they do it well, and these people here do it very well, you know. They do it with heart, they do it with soul, they are not a professional band - that is never of matter to me." Speaking as the producer, Brian reflects: "All I want is that their way they approach the music reflects the way that I approach music. You can't be an honest producer to someone you don't like. You ought to have a connection with someone, you should not produce music simply for the money, you need to have a connection. And these people have it, and I really enjoyed working with them. We worked incredibly hard, we have had limited time, limited budget to get the thing done, and we got it done. I am really eventually proud of it. I think they have just done very well." Brian himself has done very well as well, getting everything out of the skills of these six musicians. You can hear a clear influence of Brian in several arrangements of their songs and tunes on "Bothwell", and - as you will expect - these work extremely well. Reflecting the whole thing, Brian adds that the Danish thing is for him "if you like, a plus. Because everybody is involved with this great festival here in Tønder, and I am very much at home here. We recorded here, it's great." You might wonder now if a band in Denmark playing Scottish music have also Danish influences in their music. If you ask Pam, she says "I don't think in those terms because I mean I am literally grown up musically with these people." From a reviewers point of view, the music of Drones & Bellows is destinctive Scottish, but you can hear a slightly different approach, a slightly different spirit in the music. They have definitely created their own destinctive sound. There is still one question left which Pam is always asked, but she never knows why she is asked it - is it accepted by the Danes that Drones & Bellows are a mostly Danish band playing Scottish music? - "I don't see why people are always on about this, Danish people playing Scottish Music, German people playing Irish music. Because Danish people are playing also Blues and Jazz and all sorts of music from all sorts of strange places - and nobody asks them, they are always asking us! How can a Danish person even dream of playing Scottish music and so on. You know we are not that much far apart, these two kinds of music. This is the question everybody asks; I don't understand it, you would not go out and ask the local Blues band why they play Blues." In the end, for the very most people it seems to be no problem to have there Danish people playing Scottish music. People enjoy Drones & Bellows' music - and why should they not?! FolkWorld had a FolkWorld Scene from Inside" with the title "Life with Brian" in German language in issue 10, with Pam Naylor reflecting the production of their new CD with Brian McNeill. To contact Drones & Bellows, e-mail Pam. Photo Credit: All photos by The Mollis. 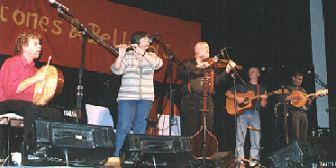 The Continental Celts is a irregular FolkWorld series, presenting regularly the best Irish folk bands based on the European continent. Having started with Shantalla and Orion, both from Belgium, next issue we move on to Germany and one of its best new representants of "Continental Celts".